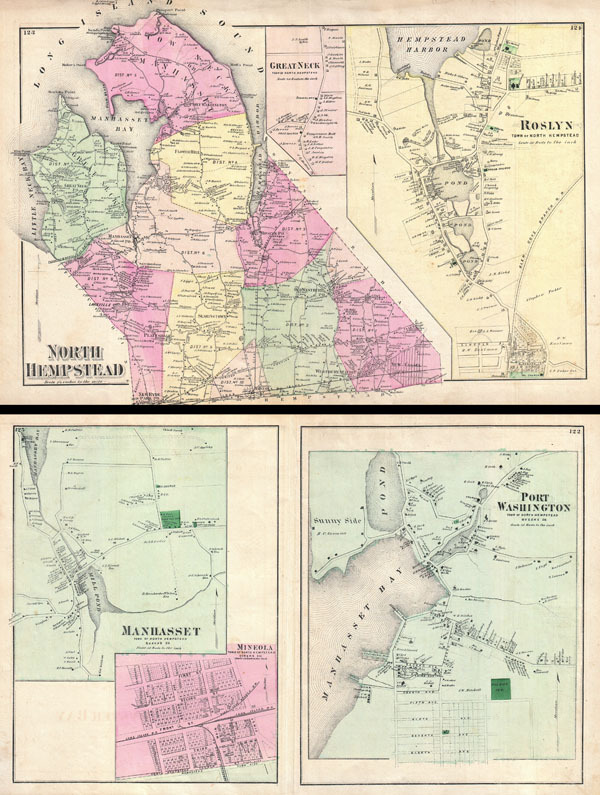 North Hempstead / Port Washington, Town of North Hempstead, Queens, Co. / Manhaset, Town of North Hempstead, Queens Co. / Mineola, Town of North Hempstead, Queens Co.
A scarce example of Fredrick W. Beers' map of North Hempstead, Port Washington and Roslyn, New York. Published in 1873. Covers roughly from Little Neck Bay and Great Neck eastward past Manhasset to New Cassel. Includes large inset plans of the towns of Great Neck and Roslyn. Verso features town plans of Port Washington, Manhasset and Mineola. Detailed to the level of individual buildings and properties with land holders noted. This is probably the finest atlas map of northern North Hempstead, Long Island to appear in the 19th century. Prepared by Beers, Comstock & Cline out of their office at 36 Vesey Street, New York City, for inclusion in the first published atlas of Long Island, the 1873 issue of Atlas of Long Island, New York. Very good condition. Original centerfold. Maps printed on both sides. Verso repair at some places near bottom margin. New York Public Library, Map Division, 1527315, 1527314, 1527316.